Introduction: Quantum rounds out our low speed cranking reel shootout with the Energy PT �Power� reel which features a low speed 5.1:1 gear ratio to help retrieve deep diving long lipped crankbaits. This high torque reel features many of the features that Quantum is known for including use of ceramic components and a durable multi-coated finish. 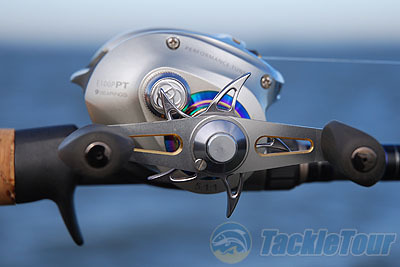 Impressions: The Quantum Energy PT sports a more aggressive look than the other cranking reels in the shootout. The vented frame styling on the face of the reel channel Daiwa but Quantum turns it up a notch with the inclusion of a ported aluminum metal handle and drag star that look like a double edged sword and ninja star paired side by side. Both these components feature a very angular look and are finished with titanium coating to create attractive and durable gold highlights. These gold elements match nicely with the multi-colored finish which can be found directly below the drag star on the handle side, the spool, and around the ACS cast control knob on the non-handle sideplate. The multi-colored treatment is more subtle on the Energy PT than some of Quantum�s past reels, and the company has struck a nice balance between a clean yet modern look and feel. Who put the ninja star on the Energy PT? Under the aggressively styled frame anglers will find that the Energy PT makes use of a once piece aluminum frame that houses a compact gearing with nine bearings. 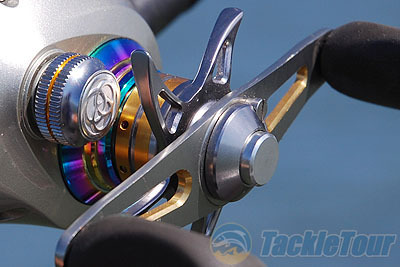 The reel features a MaxCast skeletal spool which is able to hold 135yds. of 12lb line. 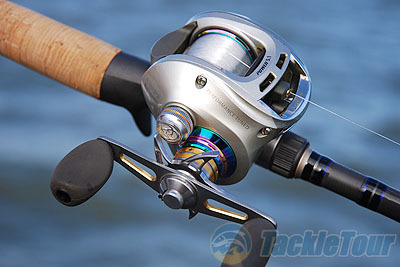 While right and left handed reels are available in both the 7.0:1 and 6.3:1 gear ratio Energy reels the 5.1:1 low speed reel is only available in a right hand retrieve.In hand the Energy PT feels relatively light in hand and weighing in at 7.7oz. 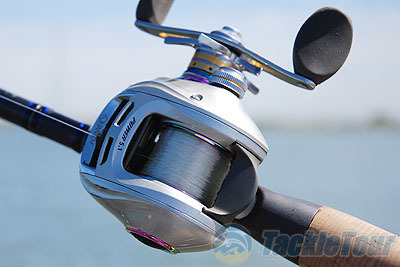 the reel weighs 1.1oz less than the Daiwa Crazy Cranker, .8oz. less than the Abu Garcia Winch, and only .1oz more than the Shimano Curado E5. For lubrication, you guessed it, Quantum loads the Energy PT with their �Hot Sauce� which is a proprietary blend of synthetic and organic additives not only improve casting and retrieve performance but also protect and improve durability of the reel�s moving components. Real World Test: To test the Quantum Energy PT we head to the California Delta to fish for largemouth bass and hoped to intercept some of the incoming striped bass coming through the bay and running up the river. We fished the reel with a variety of baits including the Norman DD22 and a variety of lipless crankbaits which included the Rapala Clackin Rap and Lucky Craft LV500. Casting: Prior to casting I took a moment to appreciate Quantum�s ACS cast control system which blends the consistency of centrifugal braking with the ease of adjustment of an external dial. With each click of the dial extra weights are restricted which increases pressure on the spool and helps provide more spool control. The system is easy to use and just plain works. Though it is unlikely anglers will need to get under the sideplate it can be done easily with a quick release switch underneath the levelwind. 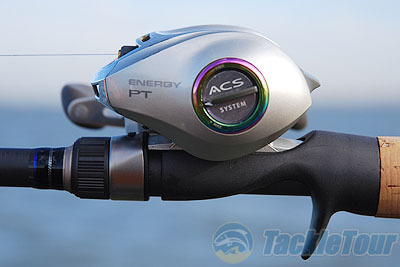 Once the ACS was dialed in I found that the Energy PT was an excellent caster and I could cast both small and heavier long lipped crankbaits with ease. 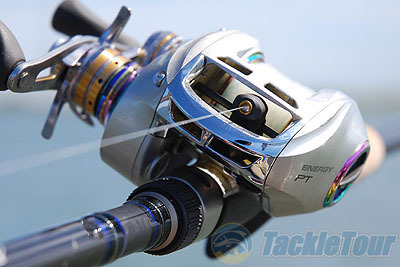 When it comes to control the Energy PT has a slightly smaller opening above the spool and the spool itself is more recessed than some of the other low speed cranking reels. If you have a small thumb you won�t notice it but if you�ve got a larger thumb you will feel the ridges on either side of the reel when feathering the spool when casting.